With the 5.0 release, Redis Enterprise provides higher availability, scaling, performance, and unmatched cost efficiency over open source Redis. Here's what's new! We are super excited to announce the general availability of Redis Enterprise 5.0. This latest software pack is now available with new modules on our downloads page. With the 5.0 release, Redis Enterprise provides higher availability, scaling, performance, and unmatched cost efficiency over open source Redis. 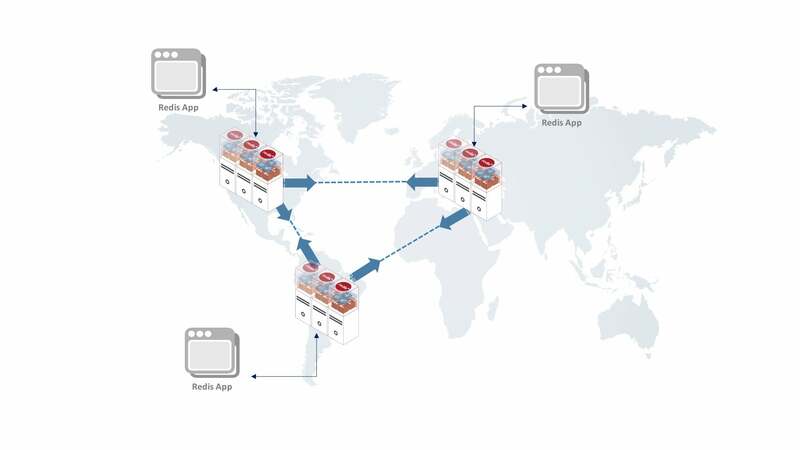 Developing globally distributed applications can be challenging, as developers have to think about race conditions on concurrent writes across regions and complex combinations of events under geo-failovers. New Redis CRDTs (conflict-free replicated data types) simplify this task by using built-in smarts that handle conflicting writes based on the data type in use. Instead of depending on simplistic "last-writer-wins" conflict resolution, geo-distributed Redis Enterprise combines techniques defined in CRDT research with Redis data types to automatically resolve conflicts based on each data type's intent. Visit Getting Started in our Redis Enterprise Pack documentation to learn more. And for information on how to develop applications with Redis CRDTs, check out our Developing With Redis CRDTs page. Low latency search results are critical for engaging users. The RediSearch module extends Redis with a fast, distributed, in-memory index for text, numeric, and geo search queries. RediSearch with Redis Enterprise scales easily to billions of documents and can instantly index many tens of thousands of updates per second while providing search results at the speed of Redis. Visit Getting Started With RediSearch in our Redis Enterprise documentation for more information. To learn about developing applications with RediSearch, visit Developing With RediSearch. ReJSON is another module that simply makes JSON processing in Redis faster. Native JSON data handles reads and writes subdocument elements with Redis commands. This eliminates the need to transfer an entire JSON document when doing sub-document updates. Visit Getting Started With ReJSON in our Redis Enterprise Pack documentation for the basics. And for more information on how to develop applications with ReJSON, go to Developing With ReJSON. ReBloom is a command that enables a scalable bloom filter as a data type. Similar to hyperloglog, bloom filters are probabilistic data structures. They power "existence search" or "membership search" with a super efficient index that uses just a fraction of the space of a structured or text index. For more information on how to develop applications with ReBloom, visit Developing With ReBloom. In addition, Redis Enterprise 5.0 allows you to install custom modules, enabling you to further extend the functionality of Redis. For example, you can add new data types, capabilities, etc. to tailor the cluster to a specific use case or needs. Once installed, these modules benefit from the high performance, scalability, and availability that Redis Enterprise is known for. The list of Redis modules is growing every day. You can build your own or explore modules built by the Redis community by visiting Redismodules.com. Redis Enterprise databases use Redis instances as the shard, and each Redis Enterprise database can contain one or many shards for scale throughput and data size for Redis applications. Redis Enterprise 5.0 includes the Redis 4.0 engine as the default version for Redis Enterprise databases. Redis 4.0 improves memory management and powers the modules discussed above. Redis Enterprise 5.0 supports the Redis Cluster API for lower latency operations. This API, along with the zero-latency proxy in Redis Enterprise, delivers efficient connection management and lower latency at higher throughputs. Your Redis Enterprise Pack cluster can now officially be deployed and run on Docker containers in production. This means you can easily and quickly deploy several containers to start running the scalable and highly available clusters Redis Enterprise is famous for. To get started with Redis Enterprise 5.0 on Windows, macOS or Linux using Docker, please visit Quick Start With Redis Enterprise Pack on Docker. With Redis Enterprise 5.0, administrator accounts can now either use built-in authentication or authenticate externally via an LDAP store. These accounts can be used to manage resources on the cluster via command line, REST APIs, or web interfaces. For more information, visit LDAP Integration. Of course, if you're interested in a more detailed view of what's new in Redis Enterprise Pack 5.0, please visit our technical documentation. You can also check out the release notes for full details on the improvements we've made over our previous 4.5 version of Redis Enterprise. Published at DZone with permission of Cihan B. , DZone MVB. See the original article here.